I recently went to Phuket, Thailand and I brought my paints with me. 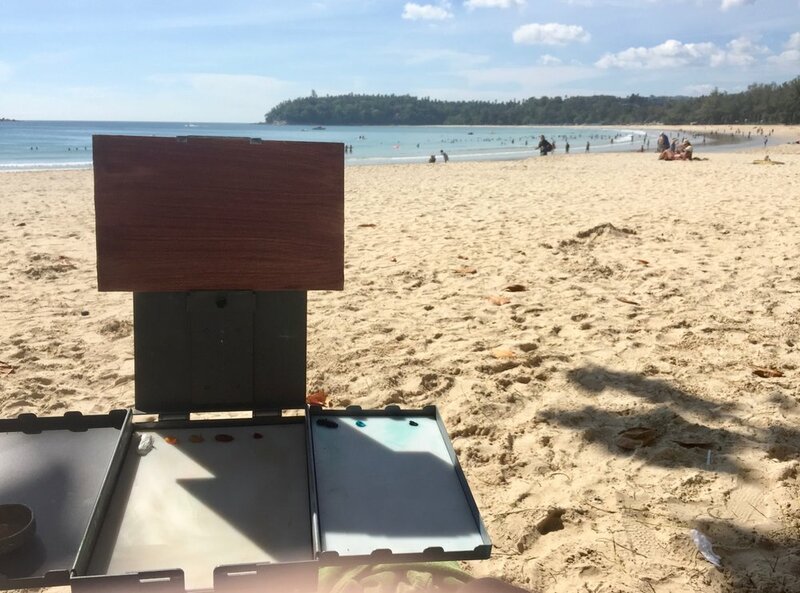 I wanted to paint a tropical beach and some palm trees I went to Kata Beach and I decided to paint the beach outdoors, known as painting 'en plein air'. It was a hot, sunny and hazy day what with Thailand being in the tropics, it's very humid. I painted this tropical beach scene at Kata Beach, I'll show you how I painted it. This was the view I painted, I loved the sandy beach and the turquoise blue ocean but I felt the painting need something extra. I wanted to create a feeling of calm and serenity in the painting so I decided not to include all the people on the beach. 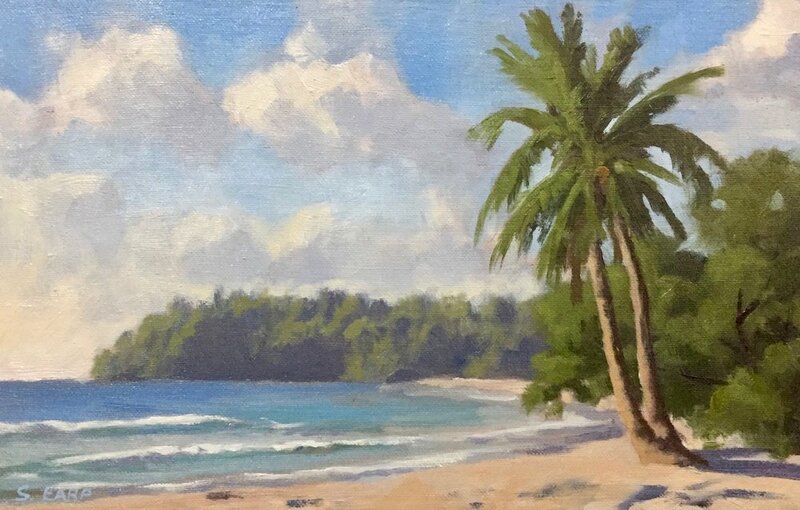 I really liked this coconut palm and I definitely thought that would complete the painting as what tropical beach scene would be complete without a palm tree. I set up my Strada painting easel which is made of aluminium and easy to travel with, and started painting. I painting on an 8" x 12" canvas panel which I prepared earlier with a layer of burnt sienna which helps warm up the painting as it comes through the paint layers but also helps with colour and tone. I paint outdoors with my canvas in the shade as this also helps with colour and tone, I find if you paint with your canvas in the full sun you'll get glare which could hurt your eyes but your painting may also end up tonally too dark. Painting in the shade helps to keep those tones lighter which means when you do turn you painting around in the sunlight the colours pop. 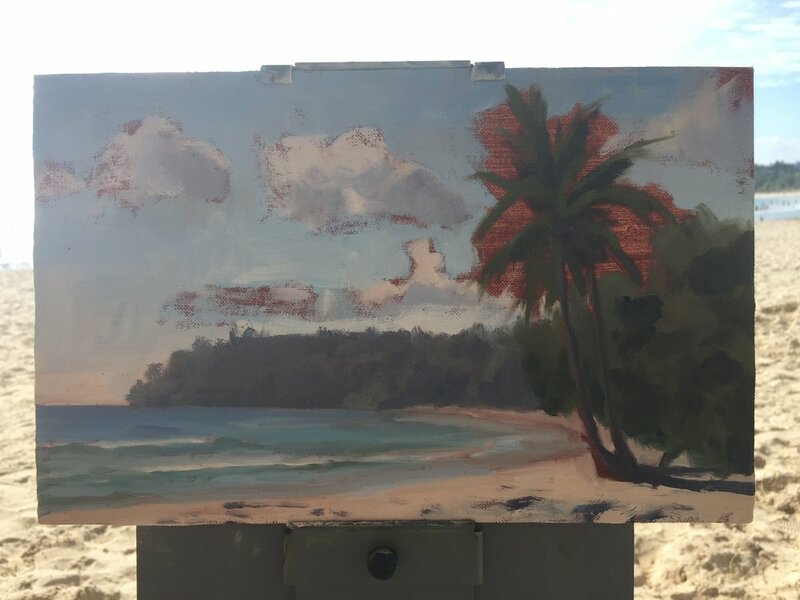 I sketched out the composition with burnt sienna, I opted for a low horizon so I could emphasise the hazy tropical sky as well as the coconut palm on the right side of the painting. Once I sketched out the composition I looked for where my darkest values are in the landscape, which in this case was the palm fronds of the coconut palm that was in shadow. I mixed a combination of ultramarine blue, yellow oxide and burnt sienna to create the shadows. Now that I have established my darkest values, I can use that to gauge the rest of the tonality of the painting. After painting the palm fronds I determined what was the next darkest value in the scene, it was the headland in the distance but as it is further away and in the background the values of the areas in shadow are not quite so dark. I need to reflect these lighter values in the painting in order to make the headland look further away and I do this by mixing a combination of ultramarine blue, burnt sienna to desaturate the blue and I add titanium white and a little quinacridone magenta to give the mixture a violet tint. No that my darkest values have been established I move onto the sky. I'm using No.6 flat brushes throughout this painting and I start with painting the highlights in the clouds by mixing a combination of titanium white with a little yellow oxide and burnt sienna. Next I paint the cloud shadows using the exact same colours I used to paint the distant headland but with more titanium white added. By using the same colours I create more harmony in the painting as it contains common elements. I paint the blue of the sky with a mixture of ultramarine blue, cobalt teal and titanium white. I add much more titanium white with also a little yellow oxide and burnt sienna mixed in at the bottom and blend it into the rest of the sky. Using the same white mixture I used for the cloud highlights I mark the areas of the crest of the breaking waves. I paint the sea using a combination of ultramarine blue, burnt sienna and titanium white and then for the lighter areas in the water I add cobalt teal and phthalo green to my blue mix to give the turquoise hue that is in the water. I paint the sand using a combination of yellow oxide, burnt sienna, a little ultramarine blue and a lot of titanium white. I form the shadows of the stems of the coconut palms using a mixture of ultramarine blue, burnt sienna and quinacridone magenta. So next the fun part of this painting, painting the coconut palm. I mix the colours of the palm fronds that are in full sunlight with a varying combination of ultramarine blue, cadmium yellow deep, burnt sienna and titanium white. I also add a little phthalo green to the mix to increase the saturation and richness of the green. I also in places add yellow oxide to make the green look more organic. I flick the brush a little to form the leaflets of the palm fronds. I use my green mixture to paint some foliage just behind the palms and I use the shadow mix I created earlier to refine the palms and trees behind. I paint the foliage in the distant headland but given it's further away I have to desaturate my green otherwise it'll jump forward in the painting. I mix this green with a combination of ultramarine blue, yellow oxide a little cobalt teal and titanium white. By this point the painting is coming together but there are a few things left to do in order to finish it. I go back to the sky and fill in the areas around the palm fronds which also helps to define the shape of the palms. I add more titanium white with burnt sienna and yellow oxide to the cloud highlights and fill in the gaps in a manner that looks painterly! I paint the areas in light on the stems of the palms using burnt sienna, ultramarine blue, quinacridone magenta, a little yellow oxide and titanium white. I paint the suggestions of branches in the trees using ultramarine blue and burnt sienna and I paint the shadows of the palms in the sand using ultramarine blue, burnt sienna, quinacridone magenta and titanium white. I paint a couple of dead palm fronds in the crown of the coconut palms as well as some of the yellow hues in the floral areas of the palm. I paint this with a combination of burnt sienna, cadmium yellow deep, ultramarine blue and titanium white. ...and with that the painting is complete. My finished painting on my Strada outdoor painting easel. Kata Beach, Phuket, Thailand, 8" x 12", oil on canvas panel, painted outdoors 'en plein air'.